Indian Doors Market size was valued at over USD 1.2 billion in 2016 and will surpass 9.5 million units by 2024. Increasing consumer spending on construction and renovation of commercial & residential buildings will drive Indian doors market growth. Booming demand for energy efficient and impact resistant housing infrastructure will lead industry towards more innovative product materials. As per IBEF, Indian real estate industry is expected to reach USD 180 billion by 2020. Housing sector alone accounts for 5-6% of the Indian GDP. Private equity investment in real estate reached over USD 6 billion in 2016. Government initiatives across the countries for smart cities’ development will support the Indian doors market penetration. Shifting consumer preference towards economical housing solutions has encouraged manufacturers towards product innovations to fulfil the customers’ demand. Emerging demand for uPVC and WPC doors due to their advantageous properties including enhancing strength, versatility, limited maintenance, high insulation against noise and resistance to moisture along at affordable prices. 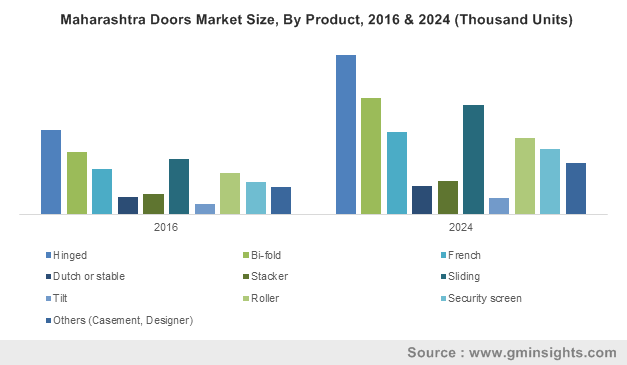 High demand for sliding and designer doors coupled with rising urbanization is likely to escalate Indian doors market growth over the coming years. Rapid economic growth has led to the construction of supermarkets, cinema, sports, and recreational complexes will positively influence demand. Increasing central & state government finances for infrastructure development projects, public funding, and a decline in the construction material prices will boost the product market growth. In addition, private and public partnerships projects to support infrastructure development in rural areas are expected to induce immense potential to the industry size till 2024. Product price is highly influenced by the design and material along with the type of raw material grade used. Government involvement in terms of setting raw material price including aluminum, steel, and wood will impact Indian door market price trend. Hinged doors market was valued over USD 300 million in 2016. Growing demand for see-through structures including doors induced with windows will propel the product market demand in commercial buildings. The product is most suitable for residential applications due to its easy fitting and lesser space consumption features. Sliding door is set to grow at over 10% up to 2024 as it provides advantage of requiring less area for opening and closing. Depending on the application these are provided with air tight and sound proof insulation. Glass provides aesthetic factor to the product with variation in design and inclusion of design customization is currently trending. Depending upon the region these can be used in 2 or multi-layer glass for enhanced insulation against weather. Roller doors are widely used in garage, kitchens, warehouses, retail shops and front gate for institutions. Steel and aluminum are most widely used materials for manufacturing this product. Shifting trends towards products with higher security will further propel the Indian doors market penetration. Indian uPVC doors market is expected to grow at over 8% over the forecast timespan. The high growth rate can be attributed to provision of benefits such as resistance to climatic conditions, less maintenance requirement, and high insulation against noise. Integration of thermal insulation, and availability of choice for colors, laminates, and patterns will support product penetration. The product is also used as a replacement for counterparts including wood and metals due to easy recyclability and lesser maintenance & weight, fueling the product penetration. Aluminum is anticipated to witness a substantial growth over the forecast timeline owing to its features including light weight, ductility, durability, and resistance to corrosion. Its wide usage for manufacturing French and sliding doors will propel its demand. Indian doors market players are focusing on providing a thermally improved aluminum frame to reduce overheating or overcooling due to the atmosphere. Commercial sector in Indian doors market is expected to witness a steady growth up to 6.5% during the forecast time frame. uPVC, WPC, and aluminum are among the key revenue generating materials in this segment. Durability and less maintenance requirement will drive the overall Indian doors demand. The trend of renovation in the hospitality industry pertaining to themed restaurants and hotels will open new avenues for the Indian doors market growth. Collaborations with the architects undertaking new projects and customizing products as per demand are the key strategies followed by the manufacturers and distributors of the product. India ranks second in population and is projected to cross China by 2030. Necessity to develop more housing units in rural and urban areas of the country to accommodate increasing population will boost product demand in residential sector. Social welfare scheme development coupled with subsidies available for residential construction will positively influence the demand. Maharashtra generated more than USD 180 million of overall Indian doors market revenue in 2016. Growing urbanization have given rise to many projects related to the residential building construction, which has increased product demand. The state is the second most populous and the third largest by area. It has the highest GDP of USD 400 billion in 2016 and is one of the most industrialized & developed states in the country. In 2015, among all Indian states, the state was ranked seventh in the Human Development Index. The state has many old housing societies in the region that need maintenance and reconstruction, creating a demand for the product and replacing old ones with the new. Growing healthcare concerns owing to the presence of many slums in the state have given rise to world class healthcare facilities. The rising number of hospitals and educational institutions in Maharashtra will drive the Indian doors market. For instance, this year, MCI has approved the opening of five private colleges in the state. Indian doors market in Karnataka will witness over 10% CAGR up to 2024. The state is the seventh and eighth largest state by population and area consecutively. It ranks fourth in India with a GDP of USD 200 billion in 2016. In 2015, among all Indian states, the state was ranked 12th in the Human Development Index. The growing penetration of IT companies in the region has resulted in an increased construction of IT parks, which will drive the product demand. Further, increased migration of people in the state owing to various job opportunities offered has increased the demand for residential housing in the region, which has resulted in a growing demand for distinct types of the product in the state. Indian doors market share includes Magna International, KONE India, Fenesta Building Systems, DORMA, Century, D. S. India, Duroplast Extrusions, Beautex, Geeta Aluminum Company, Hifab Aluminum, Kalco Alu-systems, Lumani Schuco, Mahavir Aluminum, Reynaers Aluminum, Sapa Building System, and Welltech Systems. The key Indian doors market participants operate either through direct selling or with the distributors in the market. Companies with a huge local consumer base generally sell directly without the involvement of distributors. Some manufacturers own distribution channels for the supply of products along with third-party distributors and dealers. The Indian doors industry covers the entire scope of activities, from procurement, manufacturing, and distribution, to sales and after sales services. The ecosystem includes raw material suppliers, product manufacturers, importers, wholesalers, retailers, and end users. The manufacturers focus on understanding the customer’s expectations and demands. The expectations of the customers from the market primarily include zero travel. The customer expects timely delivery and installation of the product on pick up request, and visit by the representative after installation. Hassle free service is a common expectation of the customer. Manufacturers should ensure that the customers do not undergo numerous visits to the store, and they receive online status update of their order. Moreover, they expect minimal cost (replacement cost) on product and zero depreciation during warranty. Customers also expect minimal risk associated with the product purchase such as uncertainty about authorization of the dealer or manufacturer.